One of the leading suppliers of PLM software is hoping its expertise in 3D virtual reality tools will provide another option for the fashion industry to stay competitive. Dassault Systèmes, perhaps best known in the apparel industry for its Enovia global product lifecycle management (PLM) system, is also ramping up applications for its 3DVIA software to offer a new interactive environment for brands, products and consumers. Speaking at an industry briefing in London last week, Jérôme Bergeret, director of the consumer goods industry at Dassault Systèmes, explained that the challenges facing today’s fashion industry include fast fashion, global sourcing, sustainability, and fragmented markets where brands operate as retailers and retailers operate as brands. Dassault, whose customers include Adidas, VF Corp, Gap, Guess, New Balance and Gucci, has a portfolio of fully integrated systems. This includes PLM software, which is used by more and more fashion brands and retailers to control the flow of information across the global supply chain, from design and development through sourcing and production. And it says years of working closely with major apparel and footwear brands around the world has helped build a deep understanding of what customers need. It is in the 3D area that some of the most exciting developments are currently taking place – including options for 3D design, 3D merchandising and in-store layout. At French online department store Espacemax.com, a 3D online retail application developed with Dassault’s 3DVIA software is giving customers new interactive shopping experience – and boosting sales too. The new application, which is accessed via a plug-in tool on the retailer’s website, allows e-shoppers to “touch and try” products just as they would inside a store. 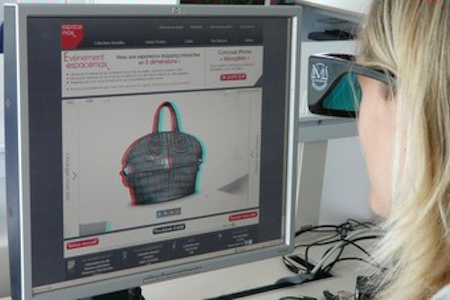 They can try bags for size by filling them with virtual objects like mobile phones and purses and, wearing special 3D glasses sent to them by Espacemax, can look at the item from every angle to view in detail its colour, material and finish. To see how the bag looks when it’s carried on the wearer’s arm or shoulder, shoppers can also try it out on a virtual animated model. By making the online shopping experience as lifelike as possible, the aim of the new 3D tool was to win over Internet users who remain reluctant to make online purchases. In its first trial, 50,000 pairs of 3D glasses were sent out by Espacemax – which then sold EUR300,000 worth of merchandise to 2000 new customers in the first three weeks of the promotion. Monica Menghini, vice president of the consumer goods industry at Dassault Systèmes, believes the company’s 3D design, 3D merchandising and in-store layout tools can provide retailers with a key competitive edge. But it also enables stores and brands to test concepts in private and without the expense of opening a physical test store. “For retailers their store space is their greatest asset, so if they get their products or merchandising wrong, their profits will drop,” Menghini says. She also firmly believes “companies need to take a top down approach to implementing technologies,” with commitment from the CEO being key to its success.